The historiography of the American Civil War, particularly the numerous events that led to its outbreak and its opening scenes have been described in myriad ways over the past 150 years. A common description used time and again compared those events to a coming storm upon the land. “The storm was upon the horizon,” or “a great storm was coming,” appropriately, but in historical hindsight, relayed the unfolding narrative of 1860 and 1861 respectively. This was not the last time that the events of war were compared to mother nature’s fury. Many young men, both North and South, compared the heat of battle as walking into a storm, bracing each step against the ground, bent in stoop, and pushing forward. The lead in the air during the battle vividly recalled as a pelting or driving rain. On this August day in 2016, the storm was already here. It was not the first time that a storm had visited the fields and ridges south of this Pennsylvania town. 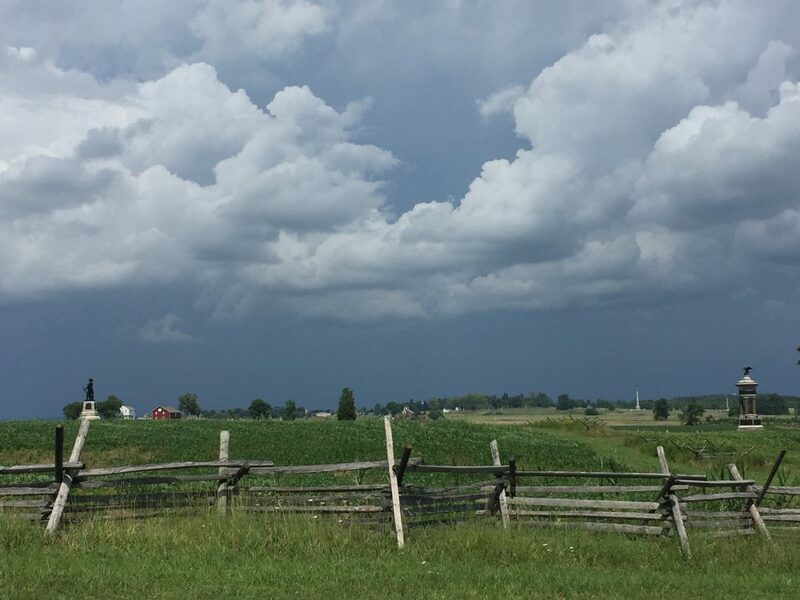 Gettysburg, Pennsylvania had seen a growing storm on their horizon since mid-June 1863 as the lead elements of the Confederate army reached nearby Chambersburg. Within a week, Gettysburg residents had their first experience with the Army of Northern Virginia as a division of the Second Corps passed through, placing a requisition on the town. The real storms of war, however, did not break on the Gettysburg landscape until July 1, 1863. The fighting west and north of town pushed elements of the Federal army through the town itself and to a new position south of Gettysburg. It was here, during most of the day, that a new, pending storm brewed. As Confederate and Federal forces worked to shake out those battle lines and develop their plans for July 2, the storm grew but did not yet break. Finally, nearing 4:00 pm, on July 2, 1863, it erupted with cannons as the sound of thunder, cracks of lightning musket flashes. The Confederate infantry went forward and the deadly hail of bullets ripped through the landscape yet again. This picture was taken from the famed Peach Orchard, looking north. The Confederate attack would continue as units arrayed south to north moved across the horizon from left to right, eventually reaching Cemetery Ridge and the Union line on the right of the image. On this day, the storm did little damage to the landscape except to bring much needed water to the ground. For those that lived the events of July 2, 1863, the storm that was the battle of Gettysburg was far from over and more fighting waged the following day. This entry was posted in Photography and tagged Gettysburg, Gettysburg National Military Park, modern-photography-17, storms. Bookmark the permalink. Dan could i get your permission to use this as a display at our civil war museum Echos Thru Time ? If so what be a good way to copy ? Hi Thomas. Certainly you can use the image. I just ask to be credited in the display for it. I can send you a digital copy that is higher resolution if I can get an email address. Feel free to send your contact information through the Contact Us link on the top right of page so I can get in touch with you. All the best, Dan.